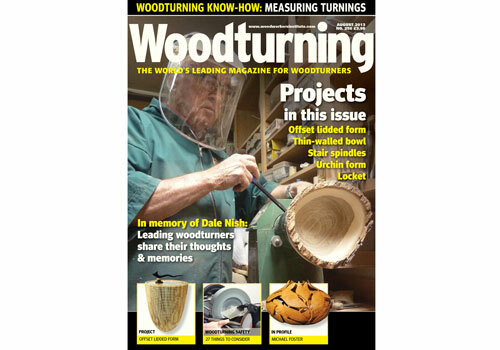 The August issue of Woodturning features a wide range of projects for you to make. Richard Findley shows you how he makes stair spindles; Mark Sanger creates a lidded form; Paul Hannaby turns an urchin form; Philip Greenwood makes a thin-walled bowl using only basic tools and Andrew Potocnik shares his locket commission with us. In terms of techniques, Kurt Hertzog discusses measuring your turnings and Geoff Whaling takes us through 27 steps for safely choosing, machining and turning your timber. In our features section, we have a special feature on the life of master woodturner Dale Nish, a profile on Michael Foster, and our Featured Artist this month is Sam Angelo. In our kit and tools section we have a range of new tools and equipment for you to look at, as well as tests on the Hamlet Glenn Lucas signature tools and the Viper3 four-jaw geared scroll chuck. As well as all this, we also have your favourite pages including leader, community news and reader's showcase, as well as details of two new competitions from Trition Precision Power Tools. All this and more in issue 256! Why not save up to 42% and download a digital copy of the magazine to iPhone, iPad or Android? Click here to find out how.